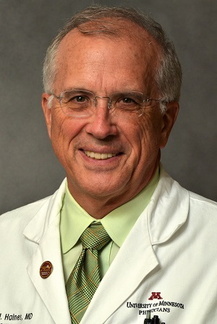 Professor Stephen Haines received his MD from the University of Vermont and completed his residency in neurosurgery at the University of Pittsburgh. He was the 1981 Van Wagenen Fellow of the American Association of Neurological Surgeons. Prior to his appointment at the University of Minnesota, he was the Department of Neurological Surgery Chairman and a founding Co-Director of the Neuroscience Institute at the Medical University of South Carolina. He was board certified in Neurological Surgery in 1984. From 2003 to 2017, Dr. Haines served as the Lyle A. French Chair in Neurosurgery and Head of the Department of Neurosurgery at the University of Minnesota. His clinical interests are in surgery of the posterior fossa and cranial nerves,and open and endoscopic skull base surgery. He has an active practice in trigeminal neuralgia, complex hydrocephalus, the treatment of Chiari malformations, and adults with congenital structural abnormalities of the nervous system. Dr. Haines’ primary research interest focuses on applying advanced clinical research techniques to neurosurgery and developing resources for the evidence-based practice of neurosurgery. He has published and lectured extensively on these subjects. He is a past member of the Editorial Board of the Cochrane Stroke Group and has led his department's involvement in numerous clinical trials. Dr. Haines’ primary research interest focuses on applying advanced clinical research techniques to neurosurgery and developing resources for the evidence-based practice of neurosurgery. He is a past member of the Editorial Board of the Cochrane Stroke Group and has led his department's involvement in numerous clinical trials. He has published and lectured extensively on these subjects. Improving the quality of clinical research in neurosurgery has been a consistent theme throughout Dr. Haines' career. He has documented the methodological inadequacy of much of the clinical research literature in neurosurgery and disseminated information about applying more modern and appropriate techniques. Over time, this interest has broadened, in parallel with the development of clinical epidemiology and evidence-based medicine, into applying the principles of evidence-based medicine to neurosurgery. Current work continues the emphasis on dissemination with recent publication about methods of teaching evidence-based neurosurgery to clinically active neurosurgical residents and ongoing work on a text of principles and examples of evidence-based neurosurgery, as well as promoting departmental participation in clinical trials. Future interests include developing small sample size analysis techniques and using a rigorous methodology to determine indications for and safety of neurosurgical procedures. A second theme running through Dr. Haines' research career has been the clinical investigation of neurosurgical infection. Studies have included risk factors for neurosurgical infection, neurosurgical antibiotic prophylaxis, and the clarification of the role of propionibacter acnes in shunt infection. Haines SJ. Principles and practice of pediatric neurosurgery, 2nd ed., Book Review, Ped Neurol 2008; 39 (1): 71-72. Bruns P, Halbert K, Trusheim J, Haines SJ. Neurosurgical oncology: tumors and treatments. Masonic Cancer Center News Spring 2008, Vol 32, Issue 1. Haines SJ. Shunt infection. J Neurosurg 2007; 106:((1 Suppl):13-4. Haines SJ. Lyle A. French, MD, PhD, 1915 – 2004 – Obituary. J Neurosurg 2005; 102(5):956-957. Malis LI, Ruberti RF, Kaufman AB, Kanpolat Y, Peter JC, Haines SJ, Blanot S, Cinalli G, Meyer P, Pierre-Kahn A. Intraoperative antibiotic prophylaxis. Surg Neur 1997; 47(5):481-483. Barnett HJ, Haines SJ. Carotid Endarterectomy for asymptomatic carotid stenosis. N Engl J Med 1993; 328:276-279. Watanabe Y, Haines SJ. Dosimetric analyses of repeat gamma knife radiosurgery, presented at Society for Neuro-Oncology, 2007; May 15. Patel SJ, Spicer K, Van Tassel P, Gordon L, Chergey A, Haines SJ. Results in a dose-escalating trial of intra-tumoral infusion with I-131/ch-TNT-1/B in the treatment of recurrent malignant glioma. Neuro-Oncology 1999; 1:S111. Nussbaum ES, Heros RC, Haines SJ, Erickson DL. Complications And Cost-Effectiveness Of Carotid Endarterectomy at an Academic Center. J Neurosurg 1995; 82(2):A371. Blount JP, Lushine KA, Haines SJ. Selective dorsal rhizotomy - long-term follow-up in 60 patients. J Neurosurg 1994; 80(2):A390 (abstract). Haines SJ, Walters BC, eds. Evidence-Based Neurosurgery: An Introduction. Thieme Medical Publishing 2006, pp 237. Committee on Post Market Surveillance of Pediatric Medical Devices, Safe Medical Devices for Children, The Institute of Medicine of the National Academies, Washington Academies Press, Washington, DC, 2006. 4.Cohen AR, Haines SJ, eds. Minimally invasive techniques in neurosurgery, Concepts in Neurosurgery, 1995; Vol.7, Williams & Wilkins, pp 286. 5.Haines SJ, Heros RC, eds. Brain stem surgery, Neurosurgical Clinics of North America, W.B. Saunders,1993; pp 357-598. 6.Haines SJ, Hall WA, eds. Infections in neurological surgery, Neurosurgical Clinics of North America, W. B. Saunders,1992; pp 259-496. Haines SJ, Glantz MJ, Smith DB, eds. Evidence-Based Neurosurgery: From Concept to Practice: Second Edition. Thieme Medical Publishers, Inc. Nov 2015. Haines SJ. Distinguished Lecture, The making of many neurosurgeon, Lecturer, presented at the Minnesota Neurosurgical Society Meeting, St. Paul Hotel, St. Paul, MN, September 19, 2015. Campbell, J, Haines, SJ. Radiosurgery versus resection for acoustic neuroma: a decision analysis. NSA/SBNS Annual Meeting, Kiawah Island, SC, April 24, 2002.